Every October I always reflect back on the time I was first diagnosed with cancer. During the nine months of treatment, I kept a journal. Cancer Survivor As I read the journal every year, there is one entry I love to read over and over again. Last February, I shared this article with our newspaper in a contest they were holding for stories of love and commitment. It was exciting to have my story selected and once again, I want to share it with you. On our wedding day, my husband spoke beautiful words to me as he shared the vows he had written for our special day. As I listened to his words and saw the love expressed in his eyes, my thoughts were more about the joy and sunlight we would experience together than on any time of sorrow or darkness. For 18 years we experienced a lot of joy and sunlight. 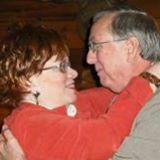 We rejoiced together as our children graduated, married, presented us with grandchildren. Then, suddenly, we faced the darkness as I was diagnosed with breast cancer. After the surgery which removed my left breast and almost all of the lymph nodes under my left arm, the surgeon told me the cancer had been very advanced and aggressive. He made arrangements for me to see an oncologist who told me “the odds are not in your favor.” I would need 16 chemotherapy treatments and over 30 radiation treatments. He basically told us to enjoy the days we had, because he did not think I would survive. Now my husband’s promise to me that his devotion would increase through sorrow and darkness faced a hard test. Words are easily spoken. This valley would test the truth of those words. Two days after the surgery, the time came to remove the bandages. How I dreaded that moment! I was confident in my husband’s love for me and I knew that he would stand by me and would say the right things. But I also knew that after all these years of marriage he would not be able to hide the truth from me. His eyes would reflect how he really felt as he looked at my deformed body. Lovingly he helped me remove the bandages. Glancing down at the area where my left breast used to be, tears immediately filled my eyes. The left side of my chest looked caved in, as if I was hit by a big Mack truck. A bright red scar ran from the center of my chest across and under my left arm. Large staples held the scar together. There were plastic tubes under my arm with fluid draining into two small bags. It was unpleasant to say the least! After removing the bandages and getting a shower, I was exhausted. He helped me get into the new bath robe he had bought for me to wear while I recovered from the surgery. It was silky on the outside with lace trim across the top, but had a soft and warm fleece lining. He picked a color that everyone said looks good on me – a light aqua. How thoughtful this gift was. The soft fleece lining was so comfortable, but the lace trimming made it look very feminine. As he helped me back to bed, I looked once again in his eyes. He smiled at me and I knew I was still loved and beautiful in his eyes. I knew those words spoken to me 18 years ago were more than just words. They were the true feelings of this wonderful man I call my husband. This entry was posted in Breast Cancer and tagged Cancer Survivor, Love and Commitment by Barbara Lane. Bookmark the permalink. I hope my story gives others encouragement – life is not over when accidents or disease make our body less than perfect. We are more than how we look. I’m re-blogging this post from 2014 because as I celebrate Valentine’s Day with my husband, I’m reminded of his love shown to me almost 16 years ago. And now as my body begins to show the signs of aging – sagging skin, wrinkles, etc. I’m glad he still makes me feel beautiful!